"That's not a spaniel," the guy said. "What you have is an English Setter with its tail bobbed." Murray was a fly fisherman, recently arrived at our lodge in Iliamna, Alaska, and didn't know me well. I sure didn't know much about him either, but I wondered what makes people sound off like that? It was after dinner, his first night in camp, and I'd been throwing a bumper across the yard for the dog to retrieve. Turning, I whipped the dummy over my shoulder and a hundred feet out into Lake Iliamna. "Fetch," I ordered. She took off in a mad dash, entered the 40-degree lake water like a Labrador retriever-all splash-and swam out to the floating bumper. Half-a-minute later it was again in my hand. "Ever see a Setter do that?" I asked. Now, it's true that Rica was black and white, and surely didn't look like the average Springer, being covered with black spots on her white flanks and back. And instead of two dark patches surrounding her eyes, Rica only had one on her left eye, but her pedigree said Springer, and she came out of John Isaacs kennel in Ohio, and she hunted like a devil possessed. I already knew we had something worth saving. "Do you hunt the dog?" Murray asked. There's hope; maybe he was a bird hunter. I guessed he probably used pointers, but just maybe-maybe-he would be interested in joining me on a little hike I already had planned for the next afternoon. I'd get to that later; the dog always came first "That's enough for tonight, girl," I said, bending over to scratch her ears. "Time to eat. Ptarmigan season starts tomorrow and I promised you we could go. Think you're ready?" Rica followed me eagerly toward the kennel and waited patiently for me to pour three cups of grubblies into the bowl. She'd get some energy biscuits before the hunt. This was to be our second season together. Although she was already almost three years old, I didn't find her until she was a year and a half. She'd been raised from a puppy by a young family in San Francisco: father, mother, and a seven year old son. But for some reason, when the spaniel was a little over a year old she was given to Gordon Breitbarth, a Springer spaniel trainer in Sacramento, California, with the request to find her a good home. By a portentous coincidence, I had met Gordon at about the same time while attending a sportsman's show in California, and Gordon obligingly put us together, with a few comments. "I've already started her training," he said, "and she seems to take to the birds quite well. In fact, if they hadn't spayed the dog, I might be tempted to keep her for field trials. She's got speed and desire a good nose, but needs a lot more work before I would consider her finished." 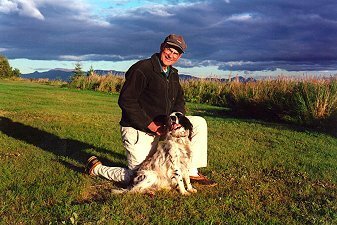 Selling puppies from an accomplished field trial champion is the way they make their money, and Gordon knew his business. His instincts about my new dog were right on the money. Rica retrieved almost a hundred birds for me that first year, both ptarmigan and ducks, and was now steady to wing and shot.